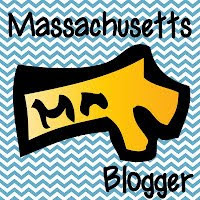 National Poetry Month is coming, although now with the emphasis that the Common Core State Standards puts on nonfiction it's become more like poetry fortnight. And technically I had to teach it at the beginning of March, but nevermind! There has always been a poem on the fourth grade MCAS test, from 2004 onward. So because our reading program has very little poetry in it, I made an executive decision and decided to teach my poetry unit, but with a few "tweaks." 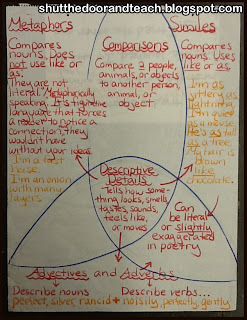 Of course the first step is to help kids understand what a poem is, and I do that by getting them thinking about how poems differ from paragraphs. We looked at a poem and a paragraph side by side a that I engineered to have nearly the same content and most of the same words. The kids came up with the following list mostly on the first day, although we added to it as the week went on. 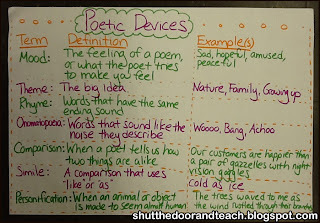 Once students understood more about what poetry is and started to get an appreciation for some (not necessarily all) types, I got into the meat and potatoes of the unit: poetic devices. Over the years, there seems to be the same 6 terms asked again and again. 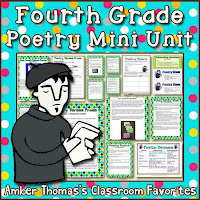 So this year I created an anchor chart with those 6 poetry terms (if you like the anchor chart, I've created a student handout and added it to the PREVIEW of my poetry mini unit. The unit itself is a priced item, but the preview is free to download). Now, as I told my students, the word "onomatopoeia" has never, to my knowledge, made its way onto our fourth grade standardized tests, but the concept is almost always there. 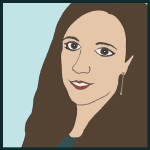 I told my students, "You don't need to be able to spell it, or even say it, but you do need to be thinking about how the poems would sound if you were reading them out loud, and why the poet chose to make that sound at that moment." Some of the poetic devices can be related to understanding fictional prose as well, such as mood, comparison, and inferring the author's meaning. So those terms have already been reintroduced and spiraled throughout the year, but during our unit on poetry they become magnified! Usually the kids can see and verbalize on their own that a poet is a writer who tried to make a point with fewer words than a writer of stories. So I tell them that figuring out what a poem means is like solving a puzzle. Each line has a clue that's hidden inside a poetic device. After thinking about each line from the text, you can figure out what the mysterious poem is really about! Two column notes (a tool we use all year across the content areas) can help us record evidence from the text as well as our reactions to it. Finally, to round out the unit, I do have the kids write their own poems. However, I don't focus so much on the form, but if they are able to use poetic devices that we've discussed. To take the pressure off of them to start out with, first I ask them to think about their favorite color, objects that are that color, how those objects move, and how their favorite color makes us feel. This year I also projected cool images onto the computer screen to get them talking even more (it's as simple as google image searching "green picture," just screen them before showing them to the kids). We wrote the nouns (objects) on yellow paper, the verbs (movements) on blue paper, and the emotions (usually adjectives) on orange paper. 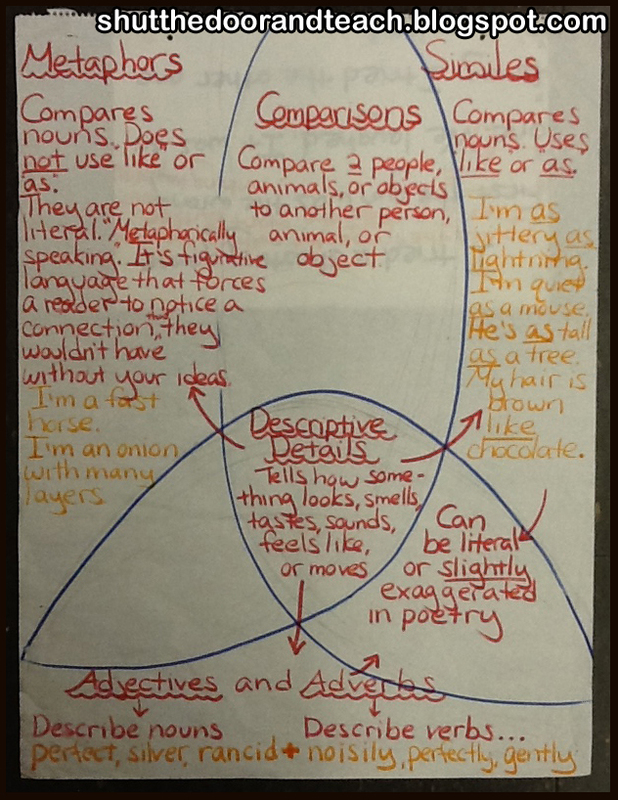 Identifying the parts of speech is the best way I know how to incorporate grammar into a poetry unit! The results are short pieces that have so much going on so quickly that they can make the reader feel like they are dreaming! Finally, we spent time talking about comparisons. They could all relate to those Geiko ads that promise, "Our customers are happier than..." I asked them to underline them in poems they read. For some kids, we stuck with using color in their writing (as green as grass) and for my deeper thinkers, we used emotion (as angry as a scalded cat). I miss teaching the different forms, like diamante and cinquain, but at the same time I feel like a focus on theme and making meaning is a worthwhile one. The kids were still enthusiastic about poetry by the third day because we still embraced the playfulness and diversity of poetry. Are you feeling pressure to limit the amount of poetry you teach?